and had been to a planetarium movie with my daughter. That was me enchanted again. 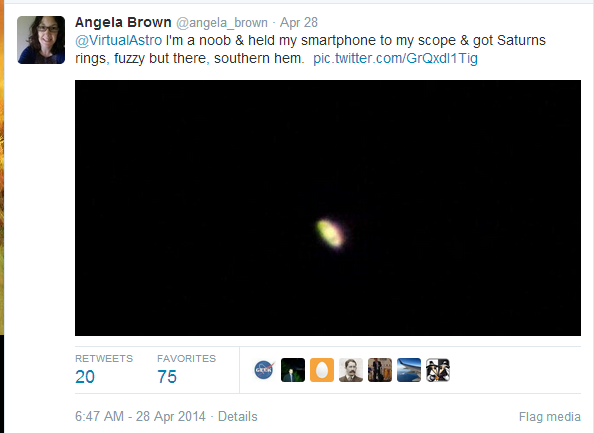 Having had a few interesting attempts at astrophotography back in 2005 with a point and shoot camera and my telescope, for a bit of quick self- inspiration, I managed to get a fuzzy rings of Saturn on my mobile phone camera through my 90mm Sky Watcher scope. It’s not fantastic quality, but this is another world, a ringed planet, the most beautiful and amazing of icon of the vastness of our universe, via a phone camera. It’s sort of cool. This has now inspired me to to go a bit further and hook up my DSLR with my scope, and use a laptop to control some of the exposure and press the shutter remotely, to avoid wobbling the telescope. 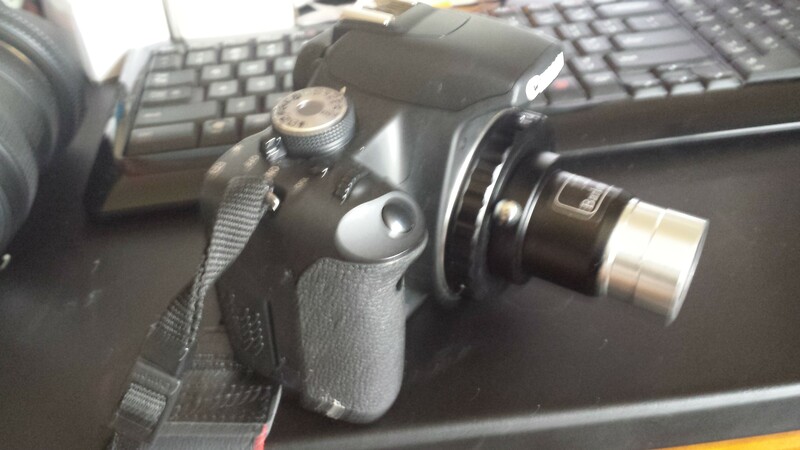 I already had the telescope and camera, and just needed a relatively cheap ($AUS 30) t-ring which connects the camera, and I new Barlow lens which had a removable magnification piece ($70). You then attach the t-ring and the Barlow lens to the camera (make sure you remove all the covers first – I had a bit of a dumb moment) and then attach the camera into the telescope eyepiece. I then dusted off my archived IBM T20 Thinkpad (I knew I had been keeping this for a special occassion). I also downloaded the Canon EOS Utility software, because my CD was long lost, hooked up a cable and this gives you the functionality to take photographs and change exposure from your laptop. Both of these approaches teach you something about exposure for the night sky and a little go at stacking multiple images, which is pretty key to some of the really cool star trail photos you see around. Now I just need a clear night and some time!